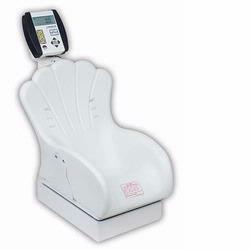 Infants readily accept the inclined seating of Detectos digital pediatric scales. With a fun, plastic, shell-shaped seat that is easy to clean, pound and kilogram readings, and heavy-duty base and understructure, this battery-powered scale has a lot to offer. The LCD display features auto zero, lock-release of weight to compensate for typical baby movement, and auto shutoff. The inclined chair seat may be mounted in three different directions, depending upon user preference. Scales from us provide a 90 days replacement guarantee ONLY if the product is non functional, and customer must save original package.